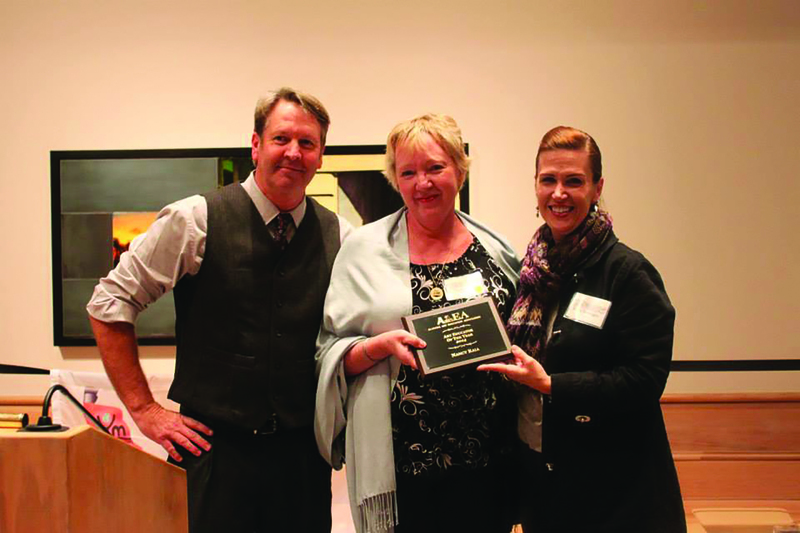 Photo features: Larry Gibson (Past President of AAEA), Nancy Raia (Community Outreach Director of the Eastern Shore Art Center) and Kelly Berwager (Current President of AAEA). Photo Credit: Paige Vitulli. Nancy Raia Named “2014 Art Educator of the Year” The Alabama Art Education Association has named Eastern Shore Art Center Community Outreach Director, Nancy Raia, as this year’s “Art Educator of the Year”! The AAEA Annual Fall Conference “Art JOURNEY” was held in Montgomery November 14-15, where art teachers from around the state gathered to share ideas and partake in various workshops. As Community Outreach Director of the Eastern Shore Art Center for the past 14 years, Raia continues to work with students from ages 3 to 101. Whether it’s a guided tour or reaching out to local schools, she relishes each and every assignment. Such collaborations include working with Weeks Bay biologist Angela Underwood each summer, combining art instruction with environmental science. She also works with high school seniors and those in local assisted living centers in Senior to Senior. This program has been the recipient of grants from various school districts across the state, seeking the mentoring to begin similar programs and art projects within other communities. Alongside art instruction, Raia has served as area judges for many competitions, juried festivals, and exhibits. She is sincerely honored to serve on the Art Committee of the United States Sports Academy. Adrienne Falls, Marketing Director at Adrienne@esartcenter.com or 928-2228 ext 103. Visit www.esartcenter.com, Facebook, or Twitter for daily updates!